Put the pedal to the metal with this metal foot switch. 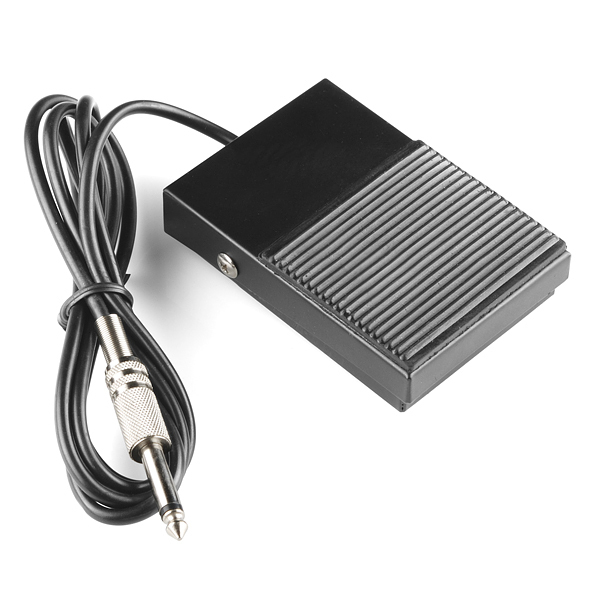 This is the same kind of foot pedal you might find switching the power supply for a tattoo machine or as a sustain pedal on an electric piano. The non-slip pad on top and rubber bumpers on the bottom keep the pedal from slipping out of place during use. If you open it up, it's a simple momentary switch and a big spring and that's about it. This pedal has, however, been described as "luxuriant, elegant and generous" and I guess we'd have to agree. 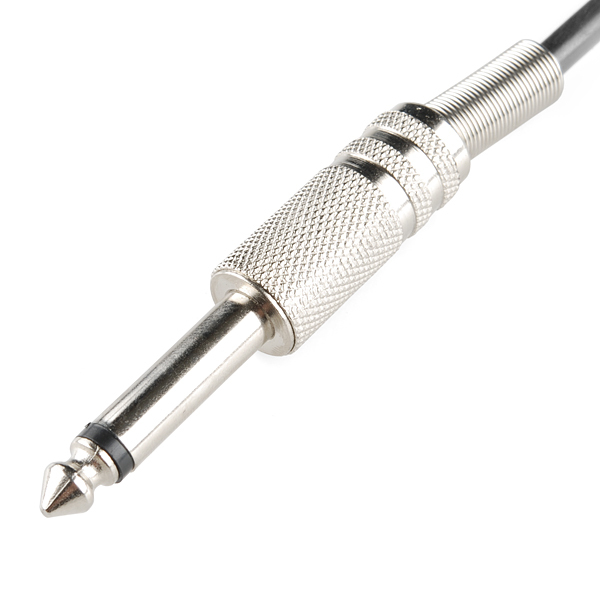 The 59 inch cable is terminated with a 1/4" mono jack making it easy to incorporate into your next build, sounds "elegant" to us. These things totally stink of badly formulated rubber. Strong chemical scent that completely fills the room. Almost makes my eyes water. Reminding me of Mount Doom. Hopefully, as time goes by and I air them out, the stench will die. Otherwise, it's a REALLY good price for a keyboard pedal! I hoped that since only a couple people complained about this, maybe it wasn't so bad, or it was fine after they aired out for a while, or maybe there was a bad batch. Nope. I let these sit outside for about a week, and I still had to wrap them in cling-wrap to mitigate the smell. I'm probably going to get lots of cancer from these things. what is the contact rating of the switch?? I just plugged a bunch of these into a StealthSwitch II, with COM-11149 to take them down to 1/8" plugs. Works pretty well, although I'm not actually sure what I'm going to do with 5 foot pedals worth of extra inputs. Can this take 240v? I wish to control my Dremel using one these. I sort of doubt it could even do 120V. Perhaps someone who's pried it apart could tell us, but I suspect it's got a simple micro switch inside. Keyboards obviously use fairly low DC voltage and a quick search will reveal that the tattoo machines that are mentioned above use at most something like 18V. I would recommend, and I think I'm going to try it myself, to use this to switch a relay. There might be a small delay and a separate battery (or transformer, though that would be kind of wasteful) would be necessary, but those inconveniences shouldn't be a problem for something like a Dremel. It seems to work just fine. The only complaint I have is that it smells like an ashtray, quickly stinking up a room. I think the rubber/plastic elements are outgassing something really nasty. I'm going to park it near a window in the garage to see if the smell dies down after a few days. Not only is it exactly like a keyboard sustain pedal, it's about a third of the cost. If you're still looking for a replacement pedal for a sewing machine, this pedal would work better, even if you had to do a little hardware hacking to make it work. Note: Posted link is to American Science and Surplus. They don't carry that many electrical/electronics, and what they do are normally unusual things (oxymoronic statement intended). Also while they don't have as wide or consistent selection of electronics as SparkFun, they are worth checking-out for other categories like laboratory equipment or just weird and random stuff. This is only on-off. On all the machines I have used the foot pedal is also a speed controller. Any plans to add a latching foot switch? Well until they do it looks like there's room enough (based on today's video) in the immobile end of the case to add a small perfboard with a 74 series latch and the few additional components necessary to implement any desired latching behavior. 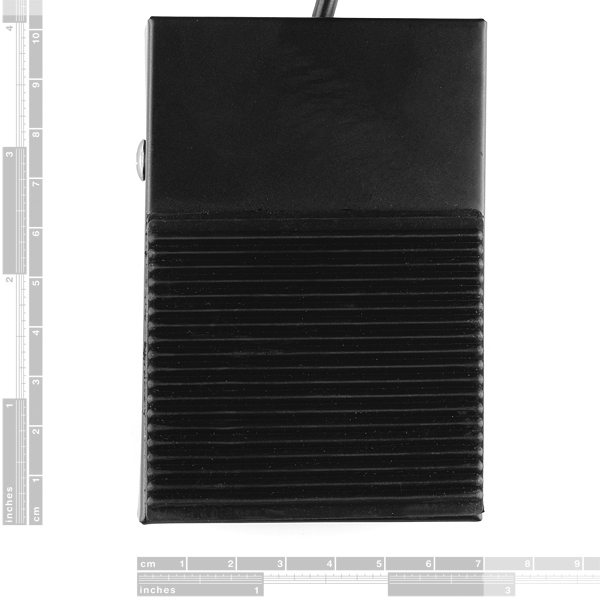 This is a good foot switch. I use it as a momentary switch for a guitar effects pedal. Works great. One small issue is that the actual switch is screwed onto the bottom of the housing. Those screws stick out slightly farther than the rubber feet on the bottom of the housing. If you didn't notice that, and you used this on a hardwood floor, those screws might scratch the floor. Easy fix, but i didn't spot it at first and scraped a table I was testing it on.